Free Advice Regarding Slip and Fall Personal Injury Claims | Craven, Hoover, & Blazek P.C. ← Does Indiana Use the “One Bite” Rule for Dog Bite Accidents? Slip, trip, and fall claims are prevalent in the world of personal injury law. Accidents like this happen when a person slips, trips, or falls, and seriously injures themselves, as a result of a particular hazard on other person or company’s property. Several hazards can cause these kinds of accidents to occur on private or public property, such as puddles, spills, leaks, torn carpeting, poor lighting, and more. If you or a loved one was recently injured in a slip and fall accident on another person’s property, it is vital to consult a reputable and experienced personal injury lawyer that concentrates on these types of accident cases. They retain the proper resources and knowledge, as well as, litigation and trial experience, to represent slip and fall victims in order to recover full and fair compensation for their damages. 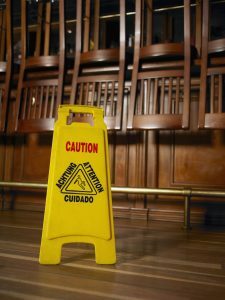 Continue reading for more free advice regarding slip and fall injury accidents, claims, and lawsuits. Anyone who is seriously injured from a slip and fall accident on a property other than their own could very well have a valid personal injury claim. Determining a claim’s validity and proving fault involves several variables and extensive investigation. A judge, jury, or insurance company must be convinced that the owner of the property was negligent in some way that caused the hazardous condition to exist, and that the victim used reasonable care and could not foresee the hazardous, thus preventing injury. Again, many variables goes into finding fault, proving fault, and more. This is why it is vital to hire a proficient personal injury law firm to facilitate a slip and fall case effectively. Property owners have a responsibility to keep their premises safe for visitors and guests. They can be at-fault for a slip and fall accident if they knew about, or should’ve known about, a hazardous condition and neglected to address it. However, there are circumstances to slip and fall accidents in which the victim is at-fault and does not have a valid legal claim against another property or company. An example of this situation would be if a woman wearing high-heels on a snowy day walks into a grocery store displaying “wet floor” signs everywhere happens to slip and fall in a puddle of melted ice. She would have a very weak case because she did not use reasonable care by wearing unfitting shoes in poor weather, as well as, ignoring wet floor signs that indicated a potentially hazardous condition. The grocery store did their part in this example by displaying wet floor signs to warn customers that the floor is slippery and to walk with caution. And there are certain elements in the law that protect property owners, under certain circumstances, from hazardous conditions caused by weather, or conditions they cannot reasonably prevent. If you or a loved one recently suffered serious injuries as a result of a slip and fall accident on another person’s property, you have the option of filing a slip and fall claim. During this filing process, evidence will be requested to prove that the owner of the property should have known, or did know, about the hazard that caused the accident to occur. To do this, hire a personal injury attorney that has experience in slip and fall lawsuits. They will provide comprehensive representation for all aspects of your slip and fall lawsuit. They can obtain compensation for damages related to your accident and injuries. As for property owners, it is strongly encouraged to purchase insurance policies that protect you from paying out-of-pocket for slip and fall accident settlements. This is especially important for commercial properties, business owners, and offices. In addition to third-party insurance, simply implementing certain strategies and precautions can better protect visitors from harm, and safeguard property owners in the case of a slip and fall accident. Call Craven, Hoover, and Blazek P.C. at 317-881-2700 to file a slip and fall accident claim in Indianapolis, Indiana. Attorneys Daniel Craven, Ralph Hoover, and Keith Blazek, as well as their proficient legal teams, are extensively experienced in slip and fall injury cases. They are happy to assess your case and determine if you have a valid legal claim. They offer free initial consultations and never collect lawyer fees unless they recover the full and fair compensation you and your family deserves. Call 317-881-2700 to schedule your free initial consultation today, and learn your rights following a slip and fall accident in Indianapolis, IN. This entry was posted in Slip and Fall and tagged filing a personal injury claim, filing a slip and fall claim, Indianapolis Personal Injury Law Firm, personal injury attorney Indianapolis, Slip and Fall Accident Claims, slip and fall accident Indianapolis, Slip and Fall Cases, slip and fall lawyer. Bookmark the permalink.